I cannot find a doll matching this description or numbering...Her outfit is lovely, very old and almost royal looking?? I have a doll matching Diane's description. But it has a thick rubber like bald cap with hair stuck in it. What is it? Thankyou diane, she is approx 18 inches high, i hope you dont mind but i would like to post a little picture of the back of her head with her number etc, thankyou, francis. The french Jumeau company was founded in Paris in 1842. Composition bodies marked "JUMEAU Medaille D'or Paris" was used after 1878. You need to provide the length of the doll. 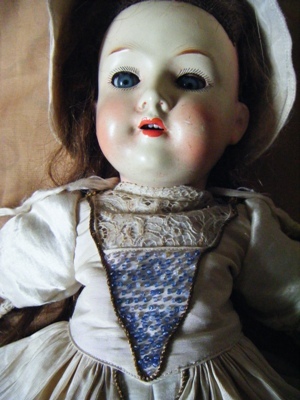 Most Jumeau dolls had closed mouths. I hope someone familiar with Jumeau will provide further info for you.